Sam is originally from Ohio. He has enjoyed traveling and the outdoors from a young age, going on hikes, paddles, and vacations with his family. He recently graduated from Paul Smith’s College in the Adirondack Mountains of New York. 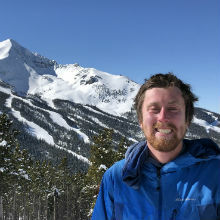 There he earned degrees in Recreation, Adventure, Travel and Ecotourism as well as Parks, Recreation, Facilities and Management and a Business minor. Sam became an Adirondack 46er; canoeing, completed the Adirondack 90 mile canoe race, and skiing. He has developed a passion for the environment and working with kids and working for the New York State Department of Environmental Conservation summer camps. He is excited to help students develop and figure themselves out at the critical growth period in their life. He is excited to bring energy, enthusiasm and understanding to Elements.